MATT Kennelly has been named the Perth Heat’s Manager for the 2016/17 Australian Baseball League season. After a lengthy search locally, nationally and abroad to replace Kevin Boles, Kennelly’s vision, hunger for success and outstanding character got him the job ahead of other credentialed candidates. Kennelly was a key part of the team’s success on the field since the ABL returned in 2010, being part of the team that won four ABL Championships in six years. Kennelly has several brothers that play baseball including older brother Tim who played with the Philadelphia Phillies. He said the advice he got from his brothers helped give him the extra confidence required moving into this role. “My family is always very supportive,” he said. “We spoke about the massive opportunity that was presented to me, and that they would continue to support me throughout the season in this new role. 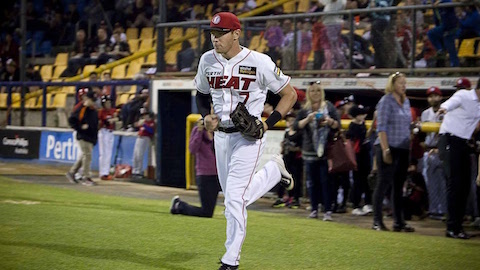 Born and bred in Perth, Kennelly becomes the fourth manager of the Heat since the revamped ABL commenced in 2010, but the first who has come through the Baseball WA system. He noted how the system has moulded him to be ready to take on this role. Heat chief executive Lachlan Dale said he had no doubt Kennelly was the right man for the job. “It’s a really exciting opportunity for Matt to take the reigns as the Manager of the Perth Heat and it will obviously be a little different from playing,” Dale said. “We think that part of the success of our High Performance program is that we create an environment for our elite players to stay around the game at the end of their playing careers and impart their knowledge and expertise to our future players.